30-Sep-2015 -- While researching this Degree Confluence Point (by reviewing satellite imagery), I came to the same conclusion as Shawn Fleming - the previous visitor, almost 11 years ago: The best way to approach this point is not from the West (directly from the wonderfully-named Lizard Lane), but instead from the North - from the end of the doubletrack that branches off Lizard Lane at 32.01919°N 110.01370°W. Like Shawn, I found this doubletrack rather difficult to drive (in my 4WD SUV), but managed to make it to the end. At this point, I was about ⅓ mile north of the point. 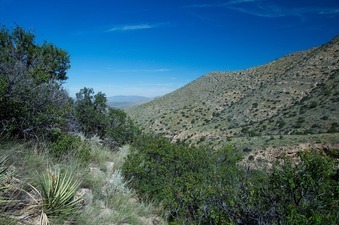 From this point, I was able to reach the point by hiking carefully along the hillside, avoiding the ubiquitous cactus (and at least one rattlesnake that rattled loudly to warn me as I walked nearby). After this unusually difficult ⅓-mile hike, I reached the point, which lies at the edge of a small clearing on the hillside, with good views in all directions. This is a very scenic location. Recently I have been making aerial videos of many of my confluence visits, using a remote-controlled quadcopter (aka. ‘drone’). Today, after returning to my SUV, I flew my quadcopter over the degree confluence point to make another video. This time, however, disaster struck! During the flight, my quadcopter ran out of battery power, and made a crash landing - somewhere. I spent the next couple of hours hiking nearby, looking for my downed quadcopter, but couldn’t find it. Perhaps it's hidden in a bush somewhere? A future visitor to this point (perhaps another 11 years from now, or perhaps even farther in the future?) may well end up finding the remnants of my quadcopter. Inspired by the story of my lost quadcopter, Shawn Fleming (who lives in nearby Tucson) decided to revisit this point about a month later to search for it. After a couple of attempts, he was able to locate it - stuck in a tree - and recover its video recording. Here - from the recovered video - is a remote-controlled aerial video of this confluence point. (Unfortunately, due to battery failure, the video does not show the final descent into the tree.) Many thanks to Shawn for locating my lost quadcopter!